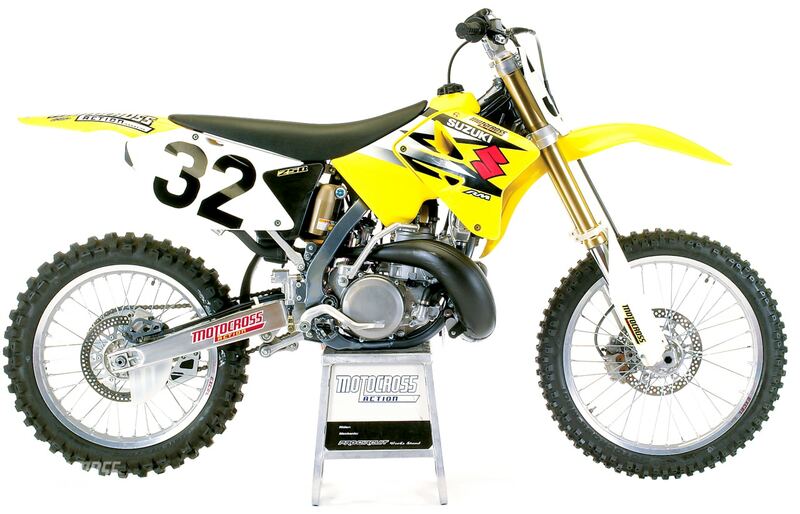 This is an archived 2005 Suzuki RM250 MXA test from the October 2004 issue of Motocross Action Magazine. Get your MXA subscription today. Mark our words. 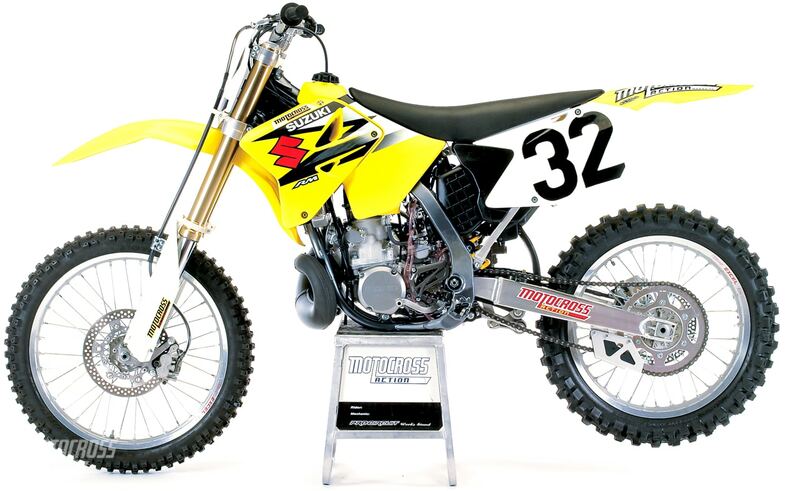 Nothing, and we mean nothing, says two-stroke like the 2005 Suzuki RM250. It is the greatest expression of what a two-stroke should feel like. It is snappy, barky, nimble, sharp, light and aggressive–it is every thing that a four-stroke isn’t. The RM250’s instantaneous response–from the engine and chassis–make it an E-ticket ride. It turns tighter than anything made. It snaps to attention with a twist of the wrist. It wheelies, power slides, steps out and flies with the best of them. It has every two-stroke trait–good, bad and ugly. That’s what the MXA wrecking crew loves about it. It’s no secret that Suzuki‘s path to success was paved by Yamaha. The engine is a YZ clone, but with an added dose of pizzaz. The powerband mimics the 2005 YZ250‘s broad overlay of vibes, but with an added crescendo off the bottom. Suzuki’s engineers may have copied many aspects of the YZ250’s port and timing configuration, but they didn’t make an imitation. No! They made an improvement. It is a terrific powerplant in its own right and is mated to a rolling chassis, suspension package and handling pedigree that is without equal. Suzuki may owe Yamaha a nod of the cap for the cylinder layout, porting and pipe, but the overall package is uniquely Suzuki. It’s slim, trim, agile and quick. 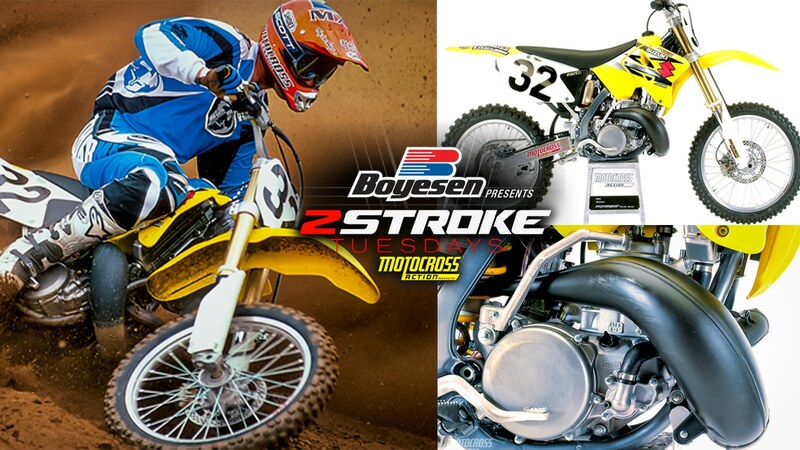 Q: IS THE 2005 RM250 ENGINE FASTER THAN THE ’04? A: You bet. Last year’s engine was very good, but the ’05 engine is better. The best attributes of last year’s RM250 were throttle response, low-to-mid thrust, roll-on control and its “power on demand” powerband. What it lacked, especially in comparison to the YZ250 (no other 250 two-stroke could play in the same league as the RM and YZ when it came to usable power) was top-end overrev. When the YZ250 kept pulling, the 2004 RM250 gave up. Not so this year. Suzuki pumped up the volume on the top-end. The RM’s traditional sign-off is nonexistent on the 2005 model. It pulls hard and it pulls long. This is a wonderful addition to what was already an effective weapon. Q: HOW DID SUZUKI IMPROVE THE RM250 POWERBAND? A: Most 2004 Suzuki riders wanted more top-end–although the thrust of the ’04’s low-to-mid power was eminently useful–top-end would be icing on the cake. 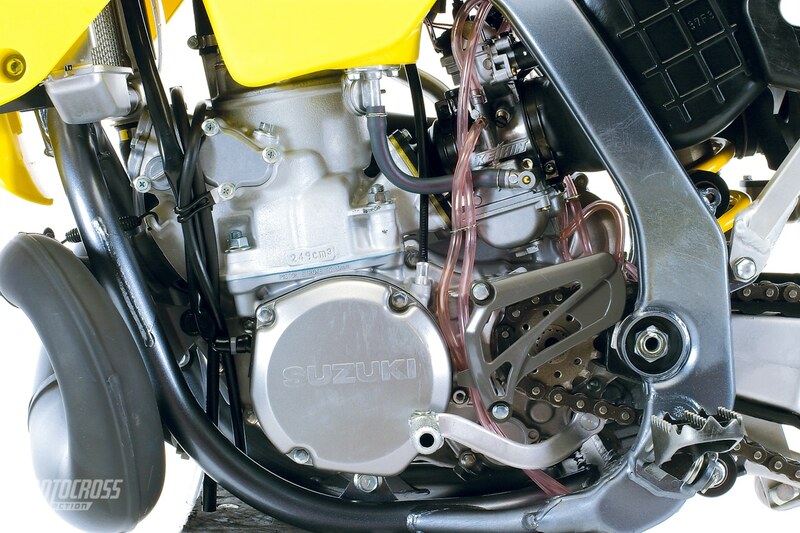 The question for Suzuki’s engine designers was how to get more top–without losing bottom. (1) Exhaust ports. The quickest way to get more top end is to raise the exhaust ports. For 2005 Suzuki subtly raised the upper corner of the main exhaust port, while widening the scavenging ports (last year they lowered the ports by 0.5mm for more low-end). This is a delicate operation. Too high and low-end suffers. Not high enough and you don’t gain anything. Suzuki’s cylinder surgeons must be maestros. (2) Combustion chamber. As important as the compression ratio is to an engine’s performance, the profile of the squish (the shape of the space between the top of the piston and bottom of the cylinder dome) is equally important. Suzuki’s engineers reduced the squish to free up a few revs at high rpm (last year they tightened up the squish for more low-end). (3) Crank inertia. For years Suzuki’s engineers were enamored with light flywheels. For the life of us, we don’t know why. More crankshaft inertia not only keeps an engine from stalling under hard braking and torques up the midrange, but it carries power further into the upper ranges. For ’05 Suzuki added weight to the system for more rotating momentum (last year the flywheels were positioned out-of-phase to produce a “big bang” sensation—they are still asymmetrical for 2005). Q: WHAT DOES THE 2005 RM250 POWERBAND FEEL LIKE ON THE TRACK? A: Impressive. The RM has marvelous roll-on power. It picks up cleanly pickup off the bottom and surges through the midrange. The RM250’s ability to translate minute rotations of the rider’s wrist into forward motion make the RM250 fun to ride. Q: WHAT ABOUT THE JETTING? A: The stock 2005 jetting is a 168 main jet, 48 pilot, 45 power jet, NECJ needle in the third clip position and the air screw at 1-1/2 turns out. We leaned it out by one main jet size (165) and set the air screw at one turn out. Q: WHAT ABOUT THE GEARING? A: It is just about perfect for the RM’s power output. Q: HOW GOOD IS THE 2005 RM250 SUSPENSION? A: Every MXA test rider loved Suzuki’s take on Showa’s suspension components. Very good stuff. Very good indeed. 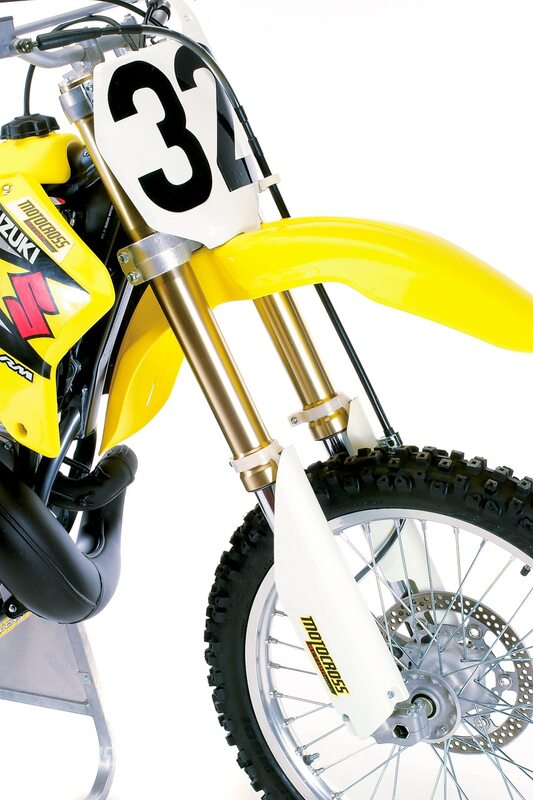 Forks: The most important thing to know about the 2005 Suzuki forks is that they are stiff enough for everyone but a Supercross pro. The stock compression setting is eight clicks out, faster riders set them on ten and slower riders went as far out as 14 clicks. The 47mm Twin-Chamber forks feel firmer and better sprung than last year. We set the rebound on 13 (the stock setting is 11 clicks out). 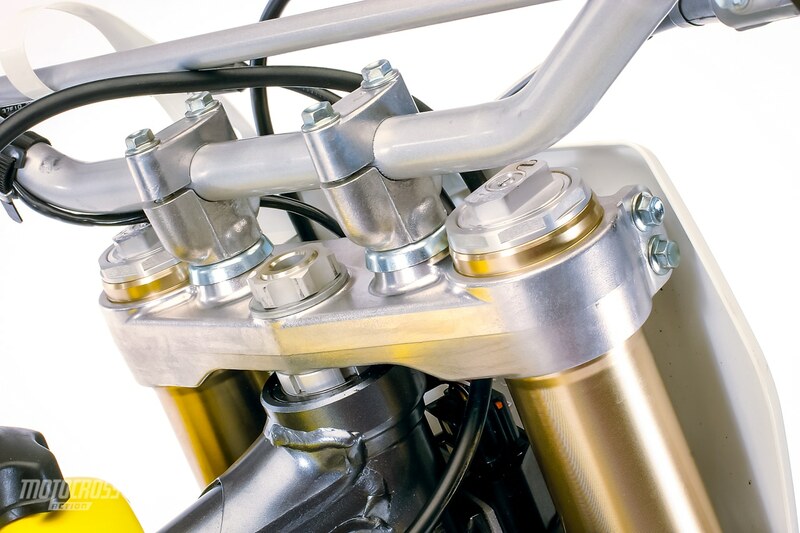 Shock: We think that the Suzuki RM250 has the best stock shock in the class. It was good last year and Suzuki knew better than to mess with it. Every MXA test rider loved this shock—without exception. It goes straight through the nastiest stuff. Never kicks, hops or burps. Lines that we eschewed on other bikes, we stormed on the 2005 RM250. Depending on your track, set the rebound on 12 clicks out, low-speed compression on 10 and high-speed between 1-3/4 and 2 turns out. Q: HOW DOES IT HANDLE? A: It super responsive. Perhaps a little too quick for some tracks. Suzuki’s designers have bristled when critics claimed that the RM250’s handling was skewed too far to the Supercross side of the handling equation. And, while they publicly took umbrage, in private they began calming the RM down a bit. The head angle was mellowed out a few years ago and last year the fork offset was changed from 24.5mm to 22.5mm. All steps in the right direction. Yet, the Suzuki still has a propensity to oversteer. This can get very dicey when hard braking is involved and leads to what the MXA test crews calls “Juan Pablo Montoya moments.” This is a reference to the Formula 1 drivers habit of over steering into bends and then correcting it with a quick snap of the steering wheel. 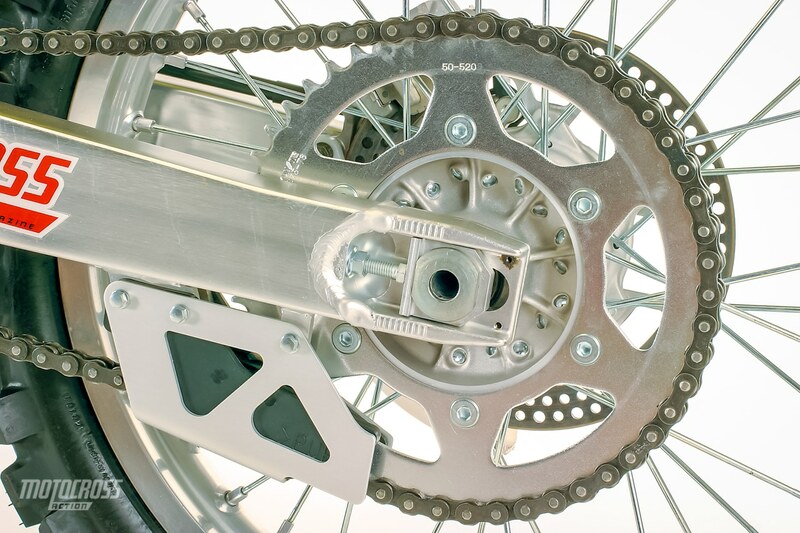 Quick reflexes are often needed on the RM because head shake, swaps and tucking the front wheel are not uncommon. Q: ANSWER THE QUESTION, DOES IT HANDLE GOOD OR BAD? A: Good. Very good. Yes Virginia, it has more head shake than the other brands, but that is the price you pay for a bike that knifes through berms, cuts inside of every four-stroke on the track and can be whipped, diced and served up cold. Make no mistake about, it is flawed, but if you are old enough to remember how great the 1993 Honda CR250 was, then you know that sometimes the best handling bikes are the ones that walk a tightrope between brilliant and schizophrenic. When Honda calmed down the CR250 in 1994, it lost its personality. It was never as sharp, accurate or lively again. 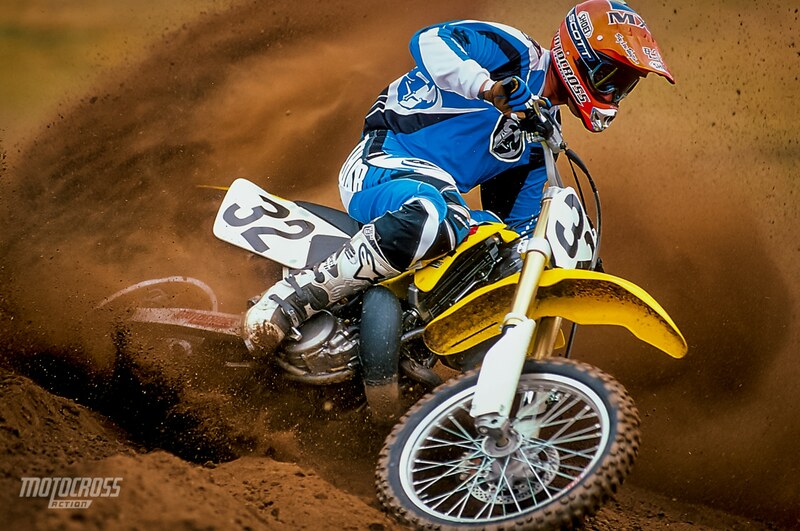 The 2005 Suzuki RM250 has beaucoup personality. Are you will to be tightrope walker for the tightest turning bike imaginable? (1) Rubber: Suzuki specs Bridgestone tires and last year their choice burned them when they chose the 601/602 combo. For 2005 they moved up a grade to the 401/402. This is an improvement. The front tire is a 90/100 size. The larger profile puts more rubber on the ground—-which is what you want on a bike as quick turning as the RM250. (2) Graphics: We are fans of low-key graphics. Expensive bike should look expensive and gaudy decals don’t cut it. We like the 2005 look, but it didn’t last long. The tank decals peeled up in two races. (3) Clutch: For the first time in years the RM250 clutch didn’t buck, jerk or chatter. But, it is still marginal at best. The release point is too instantaneous and, if you use it, you will lose it. Stiffer springs are a must. (1) Brakes: Powerful stoppers. These babies will pucker you up at the end of the straight. The rear brake is all new and a lot less touchy for ’05. (2) Bars: After decades of mild steel, Suzuki went the aluminum route. Don’t be fooled, they aren’t Renthals, like on Honda, Yamaha and KTM, but they are aluminum. (3) Footpegs: We are mystified by the sudden surge in titanium footpegs on production motorcycles. It does save weight, but so low on the frame that it has very little functional effect. And, if you are going to take the time and money to build a titanium peg, why not make it 57mm wide. That is the optimum width. (4) Brake pins: You may not be elated, but you will be when you go to change brake pads on the 2005 RM250 and discover that they switched from Allen bolts to hex-style brake pins. This a win-win on the maintenance side. (5) Shifting: Grabbing gears on an RM250 used to be like playing the lottery. No more! We didn’t miss any shifts on the 2005 model. A: We think you should run out and buy one today. Yes, we know that you were thinking about making the move to a four-stroke, but this bike will make you reconsider.